180 N. Smith, Palatine, IL. Durty Nellie's Pub and music venue, Wednesday, August 1st, 2007 at 5:00 p.m. 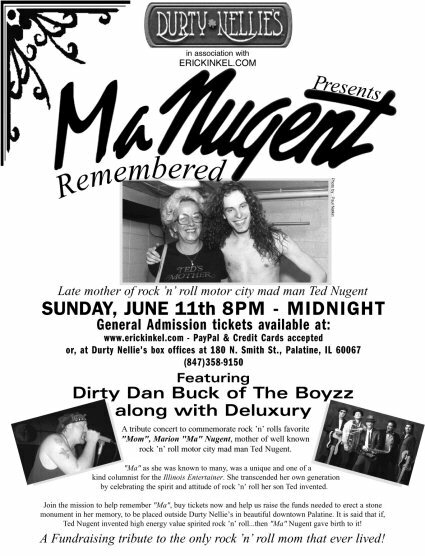 Please join me in celebrating the life of the only proverbial rock-n-roll mother who ever lived; Marion "Ma" Nugent. Long time resident of Palatine Illinois and columnist for the Illinois Entertainer. Marion was the spiritual mother of an entire generation of rock -n- roll fans. Known locally and abroad "Ma' was a friend to the world of rock -n- roll as we know it. Pioneers of rock such as Billy Joel, Eddie Money, Cheap Trick, Aerosmith, ZZ Top, Journey, Styx, Reo Speed Wagon and many, many more were all friends to her as if she were their mother to. Ted shared the unique symbiosis with his mother, with all her who embraced her wit and charm. In the years to come she created a bed rock foundation for his legendary rock -n- roll career. Although Marion passed away in 1988, I am celebrating her life and notoriety as a resident of Palatine by erecting this rock -n- roll monument. It is to be a reminder that Palatine was once home to the Nugent's. Ted and his family brought a presence to our town through Marion's grace, style and personality. Individually successful, Marion faithfully raised a family of four on Stuart lane for nearly 25 years. As a close family friend and Palatine resident it has been my personal goal to see to it Marion is recognized in a decent and respectful manner. What better way to remember the only proverbial rock -n- roll mother who ever lived, than to immortalize her in a Rock!!. This will always be a part of Palatine's unique history. 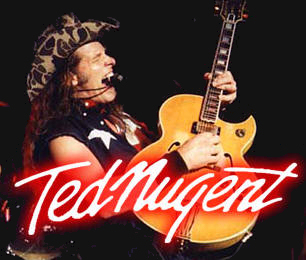 As Illinois was once his home, Ted has agreed to come to Palatine just prior to his evening performance at the Genesee Theatre in Waukegan to help celebrate the ceremony surrounding this grand tribute to his mother. Stay tuned for more details to be announced in July. An all out media blitz is being planned. So clear your calendar to come see a once in a life time event in beautiful down town Palatine. You won't want to miss it !. For more information on "Ma' Nugent see the many other page links below. 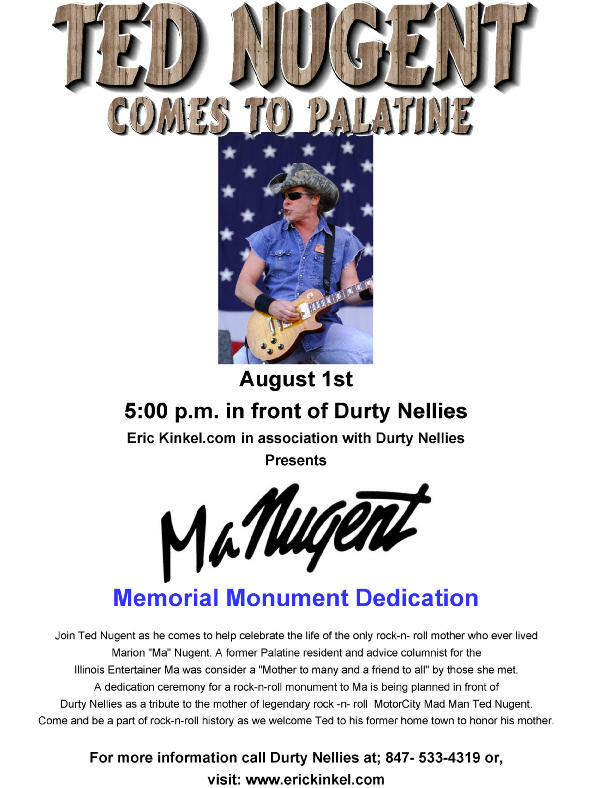 As a direct result of the "Ma" Nugent Remembered Tribute Concert held in June, 2006, I am able to continue the process of erecting a stone monument to remember "Ma' Nugent outside Durty Nellie's nightclub in beautiful downtown Palatine, Illinois. Thanks in part by donations from Paul Munagian of Class Landscaping, Palatine, Illinois, who attended the show. Paul came backstage and offered to donate the procurement and placing of the monument, and to surround it with a dazzling flowerbed. The Daily Herald Click here to read July 7th issue. For problems viewing this web site, troubleshooting, etc. Click Here to contact the webmaster general.